You can make a wine cork wreath that will be a conversational piece. They will also show off your love of wine. They look very nice and can be made many different ways. The first thing you will need is a wreath. You can use foam, wire or wicker frames that you buy at craft stores or else you can make one yourself. If you, or someone you know, are handy with wood you can make your own backing out of plywood. All you need to do is cut out a circle or heart and also cut out the center. I really like the looks of the heart wreaths made with wine corks. Now you can glue your corks on the frame in any design using hot glue. I have seen them standing straight out and I have seem them lying down or at an angle. It all depends on how you want the wreath to look. I think they look good either way. Just remember that the glue is hot and can burn your fingers very easily. I have burnt mine a few times and it hurts. You can dress them up with little wine bottles, ribbon, a small bunch of grapes and grape leaves. They even have little plastic wine glasses that you could glue on the wreath. 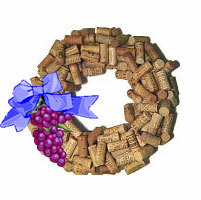 Another way to make a wine cork wreath is with a grapevine base. You can either make your own grapevine wreath or buy one at your local craft store. Glue some plastic grapes and grape leaves and then add some of your wine corks. You can make it in minutes and make a personalized gift if you use the recipientâ€™s favorite wine corks. They will love the wreath and the thought that you put behind it.